Marine biologist Peter Edmunds was prepared for the worst. Back-to-back Category 5 hurricanes had torn through the Caribbean in September 2017. The scientist and his colleagues weren't sure what they'd find when they visited fragile coral reefs near the island of St. John after the storms. "But the coral communities had become resistant to adversity," said Edmunds, who is affiliated with California State University, Northridge. Decades of reef degradation created a coral community that was resistant to the devastation usually seen after severe storms like hurricanes Irma and Maria, which hit the Caribbean and eastern United States in the fall of 2017. "The expectation was that the hurricanes were going to be devastating for the reefs of St. John," Edmunds said. 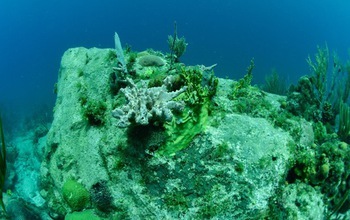 "But we found that impacts on the stony coral communities were minor. The reef and its corals had become so degraded that the hurricanes did not affect them as much as we anticipated." The results are published this week in the journal Ecology. "Surprisingly, two back-to-back Category 5 hurricanes had small effects on coral reefs in the U.S. Virgin Islands," said Dan Thornhill, a program director in the National Science Foundation's (NSF) Division of Ocean Sciences, which funded the research. "But this resilience resulted from decades of environmental decline and a shift from coral to seaweed. Corals are now so uncommon in this region that even major disturbances have only small impacts on their abundance." Edmunds and colleagues have spent 31 years mapping and documenting the state of the coral community off the island of St. John. Their three decades of research gave them the background to assess how badly the 2017 hurricanes had impacted the coral community. "This study underscores the importance of decades of ecological monitoring," Edmunds said. "If we had just gotten there in 2017 and measured the reef in the summer then again in November, we would not have been able to place the effects of the most recent hurricanes in context." Edmunds thinks the coral reefs of the 1980s and 1990s are not likely to come back. But, he said, information he and other scientists have gathered can contribute to the management of the resilience of the coral ecosystem. "Much of modern coral reef management focuses on resilience to disturbances so reefs might persist into the future," Edmunds said. "But we need to do more than just manage for resilience, we need to promote the success of corals that have great value to overall reef condition, such as massive boulder and branching species. High-resolution ecological information on the state of the reef and how it's changing is needed." The important message, he believes, is that the 2017 hurricanes have not caused catastrophic damage to the degraded reefs. "It's all the more urgent and important to protect what's left," he said. "Hurricanes may not be the biggest threats Caribbean reefs are facing. The most serious issues are the insidious and dangerous effects of gradual warming of seawater, ocean acidification and coral diseases."